Find inner peace with Miller et Bertaux's latest release Shanti Shanti. Bulgarian rose petals awaken your senses in this sparkling Eau de Parfum. The soft note of iris extract is juxtaposed with warm spices of cardamom, patchouli and Indian sandalwood. 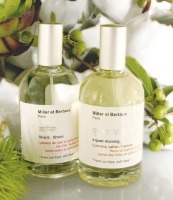 Miller et Bertaux Shanti Shanti and A Quiet Morning are available now at Aedes; 100 ml Eau de Parfum, $144. Update: see a brief review of Miller et Bertaux Shanti Shanti. I was thrown for a minute, though; those bottles look akin to dollar-store body splashes. MeB does not seem to invest in their bottles, although the early ones were cute because they had colored marbles floating on the bottom. Both of these sound worth trying to me! We'll see. Miller et Bertaux's bottles are great – no fuss, no pretension, old school style, the way perfume should be presented. I'll take them any day over the plastic toy things we see so much of. I picked up two MeB fragrances at very reasonable prices a while ago – “Spiritus (Land)” and “Green, green, green and … green”. Admittedly it was the bargain price that sealed the deal on each one – I generally prefer to mull new fragrances over for quite a while before buying – but I've grown to love both, especially Spiritus. It's bracing, rarefied and has a sort of ancient beauty about it. The notes for these two new ones seem to be following a similar theme that reaches for the ancient orient. I'm very keen to try them. Like lunarpanic, I'm also a fan of both Spiritus and Green, green, so I'm looking forward to trying these two. However, I'm wincing at the price increase. Spiritus and Green, green are both still available at $110. I'm guessing that the price increase for the two new ones is due to the dollar's shrinking value and that the price on the previous scents will also be increased when it's time to restock. I adore the Green, and hope these will be as good. I don't mind the bottles but they're rather plain for the price — but that is true of many other brands these days as well! OOOH! OOH! OH! Will Aedes do samples? Rose, iris and cardamom with sandalwood – my perfect scent! Yes, they'll do samples of most anything they sell. Breathe deep! Sorry for the lateness of this post…I didn't get on with either Spiritus or Green (too offbeat for me), so was thrilled to find Shanti Shanti totally my kind of thing – sample arrived today! Luscious rose, smooth and velvety, woody drydown, I am swooning away here! For those of you who like SSS's Velvet Rose, this is another beautiful blended rose scent. I liked it too…and reviewed it together with the SSS Vintage Rose (which I keep confusing with the Velvet one). Of course you did – that great thread on lots of different roses – I had forgotten that you featured Vintage Rose there. I need to retry the Vintage one, but am very smitten with Shanti Shanti which, having checked back, I see you also describe as “velvety”! It wasn't noticeably spicy on me, despite the cardamom. Also tried Quiet Morning, which had a harsh, antiseptic opening, but after this noisy wake up call it did indeed quieten down nicely. Overall I found it more muted and indistinct than Spiritus and Green, which were oddly herbal – or oddly something. Quiet Morning didn't wow me particularly, or last very long even, but it didn't have that distinctive, almost “tingly”/”zingy” M & B feel about them that the other two shared, so I liked it better. You would never think Shanti Shanti was from the same house, mind. Did you try their last one prior to these? Guaiac & Pear, I think, also very muted in comparison to the earlier scents in the line. I thought it was too muted, but I know it has fans. I haven't, no – just Nos 2 and 3 before this pair, and as I say, they had that definite house style that wasn't me. The only scent I have ever tried that I have considered TOIO muted to bother with at all – espeically at the price! – was Armani Prive Oranger Alhambra. Its staying power was so subliminally short, it was laughable. I like Guaiac notes and also pear, so I might give this one a go – thanks! I caved and bought a bottle of A Quiet Morning, mostly because I, too, really loved the drydown. On me, I really feel the tumeric/wood mix, coupled with something a little peppery. It has moderate staying power, which might be a good thing, since I wore it on the first day of school and my students pronounced that I smelled like “clean toilet…and not in a bad way.” Ouch. I think your students may have exactly put their finger on the “house style” of M & B, which I struggle to describe in the posts above, though I do reach for the term “antiseptic” at one point, also “fizzy” and “tingly”, all hallmarks of an efficacious janitorial product. Oh dear! Well, I hear that sort of thing all the time and I just forget about it. Hope you can too, since you already love the scent!